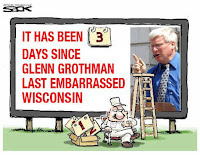 When Congresscritter Glenn Grothman (R-WI) opens his mouth, it's a very sure bet that something stupid and inane will come out of it. 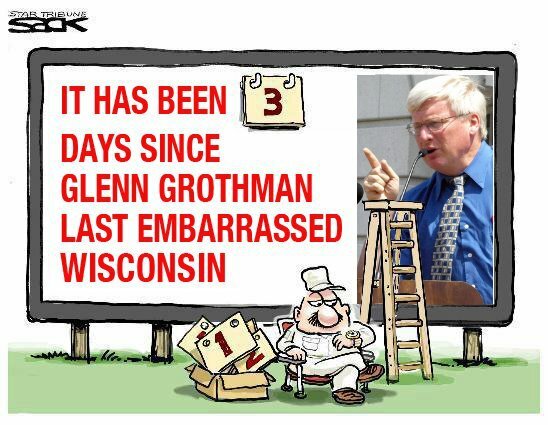 Some of Grothman's greatest hits include his war on Kwanzaa, saying that people who vote "inappropriately" vote for Democrats, and that Planned Parenthood is not needed because he's a guy. He kept the streak alive just before Christmas by going on CBS58 in Milwaukee and getting a hat trick of absurdity. "The biggest cut was to the average guy," Grothman told the CBS 58 News at 4. "The few people who are complaining are people in high tax states and they're the wealthiest people complaining. Even Barack Obama wanted a corporate tax cut to make us more competitive with other countries across the world." Yeah, well that sure explains why billionaires were running an ad thanking Trump for the tax cuts. They're just average Joes, right? Grothman says when he returns to Washington after the holiday break, he hopes to see action on welfare. But he's preparing for a fight from those within his own party. "It will be one more time Donald Trump and a republican like me want to take up welfare reform. Mitch McConnell said he wouldn't. There's going to be a fight, I think, between Donald Trump and reform minded republicans against kind of the republicans stuck in the swamp. I hope I"m able to win on that one and get welfare reform." Since that time, two Trump associates have been indicted and a third admitted to lying to the FBI about contacts with the Russians. So, has his view changed? "We don't feel there's going to be a problem with the Trump campaign," insisted Grothman. "I think the Russian meddling may have been more something for the Clinton campaign. We're not focused on that. It's been weeks since any republican talked about the last campaign. We've been in meetings looking at welfare reform and doing tax reform." Let's review: Trump campaign - 3 down and more to come; Hillary campaign - No indictments. I wonder what is the color of the sky on Grothman's home planet. If the economy is going to grow so much from the cuts then why do we need to pay for them now?